Queen Wyrm woke up! "Valyndra's greed and thirst for destruction are legendary!" Lieutenant Valyndra's miniature will make a real massacre in your parts of Descent: Travels in the Darkness! 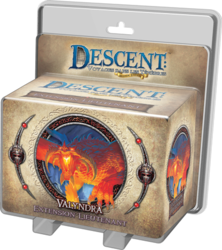 This lieutenant expansion also contains the Intrigue card deck "Dragon's Greed", as well as Threat Tokens, to give the Evil Lord new options and allow him to recruit the fearsome Valyndra in any Descent campaign: Travel in the Darkness.